An electronic control unit (ECU) is the foundation of nearly all machines with mechanical and electronic components. If you think of a machine as a “human body,” then the ECU is its brain. It acts as the command center for components to tell parts how and when to operate with each other and the surrounding environment. Whether temperature regulation, power distribution, or movement control, ECUs keep systems running quickly, safely and efficiently. For developers navigating the early stages of machine development, selecting a production ECU is one of the most important decisions in this process. Unfortunately, it’s not an easy one to make. There are a lot of ECUs on the market at a variety of price points, so narrowing down one that’s right for you is challenging. Not to mention, choosing a production supplier can have a large effect on your whole project. This decision will affect your project timeline, what resources you need for development and their cost, as well as end system bill of material costs and final quality. With all these variables in play, where exactly should you start? 1. How does the ECU’s quality compare to industry standards? The ECU you select should be developed to the highest quality standards. Otherwise, you risk problems down the line that could impact end-product quality, customer perception, and your bottom line. Quality manufacturing processes require significant investment which must spread over many units. Avoid these issues by looking for an ECU from a high-volume supplier. 2. Is the pricing economical at volume? Consider scalability. Ask if the supplier can meet your demand and offer volume pricing. These questions will help you maximize your budget and minimize frustrating hold-ups as you scale up from concept to production. 3. Is the production supply chain secure? You shouldn’t invest in development, tuning, validation, and processes only to discover that the ECU supplier has gone out of business, dropped your ECU selection from its offering, or made a significant change without warning. Think about supply chain security, or look for an ECU production provider who carefully selects suppliers such as major OEMS, like BOSCH, Continental and Visteon, to provide mass quantities of reliable ECUs. 4. Can I easily select hardware variants for other applications? Once you select a production vendor, your team will invest time and resources learning the ECU and its associated products and tools. What happens for your next application or product? 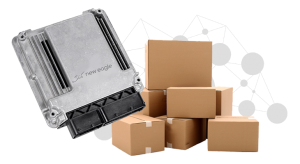 Ask targeted questions to find out if you can select other ECUs with minimal changeover effort from your hardware supply chain vendor. For example, is it easy to move software over to another ECU? Do supporting tools or staff training transfer over? 1. Is the supplier flexible enough to handle your development plan? If you plan to work iteratively, make sure your supplier’s tools and processes support fast development. Find out beforehand if you will have to wait weeks to change something like an input/output pin or CAN message definition. If your design changes during development, your software needs to adapt quickly. 2. Do you want to have control over your intellectual property and project timeline, or would you prefer to depend on the ECU production supplier for future software changes? If you plan to hire an ECU supplier to create a turnkey solution for you, ask if you’ll receive the source code at the end of the project. Know ahead of time if you’ll be able to make minor tweaks to the functionality on your own, or if you will need to re-engage the supplier. Without the ability to make changes on your own, you’ll lose control of your project’s timeline. Re-engaging down the line is costly and time-consuming, which could lead to missed opportunities for your solution in the market. If intellectual property is considered a part of the value of your company’s solution, then it’s important to determine if you’ll own the software after the project. 3. Do you have additional requirements for data logging and connectivity? If so, have you considered how the ECU selection may influence this? Custom solutions for data logging or remote connectivity adds significant time, cost, and risk to your project plan. Will you need to provide remote, over-the-air updates for ECUs in your system? Typically, this will require cooperation with the ECU vendor. Before you undertake any engineering efforts to source a supplier, find out what’s already supported or can be provided quickly. As the electronic ‘brain’ of your system, the ECU will drive the overall machine operation. Consequently if there’s an issue, oftentimes this stops development progress and puts your business opportunity at risk. Finally, ask about product warranties. Since each ECU has operation limits for each circuit, you’ll need to be sure your application won’t overwhelm the hardware – will you need support from your vendor to be certain that you aren’t abusing the hardware and thus nullifying a standard warranty? Will your supplier tailor a Production Supply Agreement specific to their needs? The production supply agreement should include an engineering analysis and documentation of how the customer’s application uses ECU resources, assuring operation within hardware specifications. Consider these two questions so that you can identify a reliable supplier and avoid these risks. 1. Is the production ECU supplier accessible and responsive? A motivated supplier is key to your success. With many ECU suppliers only offering support to developers producing over 10,000 units per year, identifying a vendor appropriately-sized for your solution may prove challenging. Ask a prospective vendor what account size they commonly handle. Frankly, if most of their accounts are 20,000-50,000 units/year, do you think you’ll get first priority when you give them a call and tell them you only have a need for 500 units/year? 2. Does the vendor have templates, intellectual property and training to help you and your team get started quickly? Your ECU supplier should understand your challenges and offer ways to accelerate time-to-market and continued success. Therefore, ask about application templates, engineering resources and training. Clarify if they’ll add on further training and resources to onboard new additions to your team later on. This willingness to work with you and be flexible with your needs can make a huge impact on your timeline and success. We have spent years developing relationships with industry-leading, global suppliers to develop a comprehensive line of products. Our team of experts can identify the best production ECUs to meet the needs of your solution. Contact our team today to discuss how we can work with you to meet your project’s goals!